Posthumous vault raiding has resulted in a gloomy but worthwhile collection from former Associates front man. When Billy Mackenzie committed suicide in 1997 at the age of 39, he left behind a wealth of unfinished material. Some of this material was more in the style of his electronic associations, and some were stark, brooding piano based compositions. This posthumous release falls firmly in the latter category. 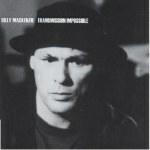 Transmission Impossible is a dark and haunting collection taken from Mackenzie's personal archive recorded sometime between the demise of the Associates in 1990 and the singer's own death. This 13-song set contains a mixed batch that showcases the transcendent quality of Mackenzie's vocal capabilities. That there should be covers of songs by two artists who Mackenzie never made any secret of his affection for should shock no one. Moreover, the loving manner in which they are treated gives them such a charm that brings out the best in the performances. These two songs, "Wild is the Wind" (a Johnny Mathis tune made famous by David Bowie) and the Sparks classic "Never Turn Your Back on Mother Earth" are just perfect. Really, really lovely to listen to. Indeed, I would go as far as saying that only Mackenzie could have pulled off such a "in the style of Bowie" cover without it sounding like pastiche. Transmission Impossible plays mostly like a version of Satie's "Gymnopédies" with suitably cryptic lyrics. Nonetheless, like all works of art created by troubled genius, it has soaring highs and broken glass in gutter lows. Visitors to the Billy Mackenzie museum are led to ponder the sublime "Satellite Life" and "And This She Knows", then as unwilling, but transfixed listeners, we are dragged to gape at the quite ludicrous "Liberty Lounge" and "At the Edge of the World" that frankly take the Berlin period Bowie template a little too far. You have to ask yourself, if Billy Mackenzie were alive would he actually release this record? It is the record of a man freed of the record-making system and given the liberty to delve into unexplored emotions through the medium of song and tape. However, it is also the record of a man without a producer. Lest we forget that producers do not only prettify the sounds that artists produce, they also shape the songs and performances into the finished product. What we have here is something between demo and the deep blue CD. That aside, it shows such promise to make you speculate what a wonderful album it might have been if it had been given that care and attention of say, a Scott Walker album. One can only hint at the greatness that might have been. But alas, this is not such an album. This album is a selection of not quite finished examples of the songcraft of a man who's superlative voice defies proper description. Transmission Impossible succeeds best as a platform for Mackenzie's voice that was a powerful and sweet thing to behold. Whether in spooky falsetto or Bowie-esque mode, he rarely disappointed with a vocal performance. It will forever be a shame that the man's brief brush with electro pop stardom in the 1980s never really took hold with the Associates. Sadder still, with this release we are left with hints that the man was capable of so much more, and left in his wake so much unfulfilled promise.